Murder is Everywhere: St Kilda. The Lonely Islands. 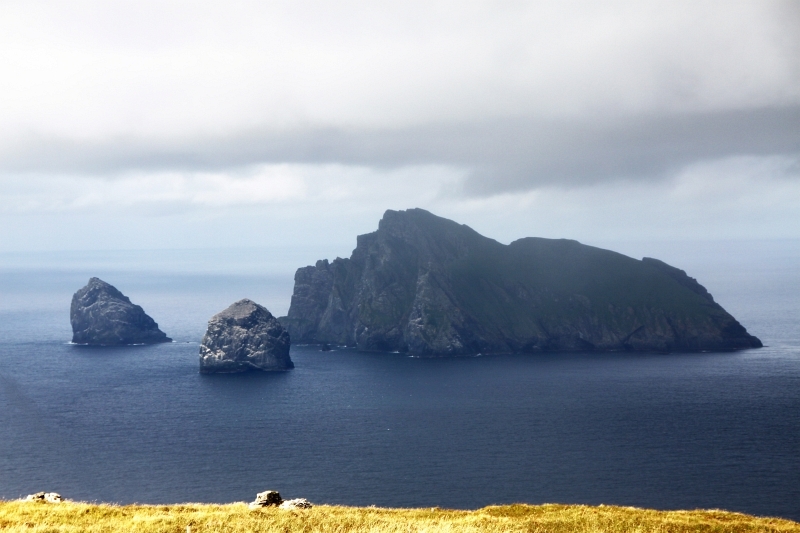 St Kilda are the loneliest islands in Britain. It was inhabited until 1930 when the locals found out that other parts of the world did not smell of rotting sea birds. I bet Mykonos is a tad more fragrant. 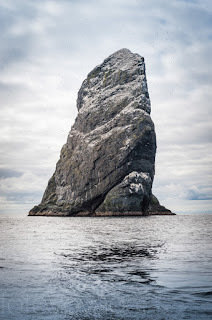 St Kilda is an archipelago 40 miles North West of North Uist consisting of Hirta, Dun, Soay, Boreray and lots of rather impressive bits and bobs. It is visible from the summit ridges of the Skye Cuillin 80 miles away. The rainfall is high, 55 inches per annum. Temperatures are 5 degrees C in January, 11 degrees C in July. The prevailing winds are ‘strong’ usually 15 mph, gusting 115 mph, with 130 mph gusts recorded at sea level. Tidal range is normally 9.5 ft, with swells of 16 ft. I know now that you are really keen to go so here are some things you might want to know. Some of them are true. 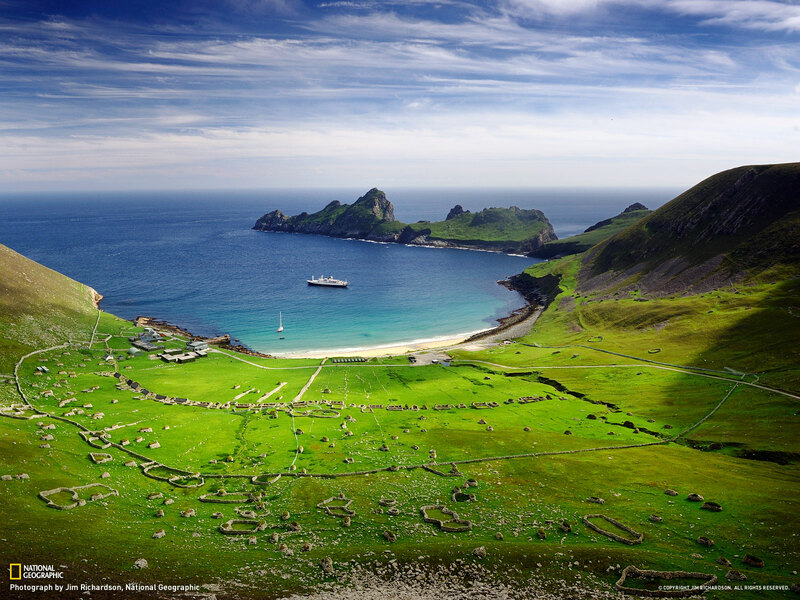 The National Geographic got a photo of sunshine on Hirta- rarer than a free pint from an Aberdonian. 1) It has been inhabited for two million years, the population never exceeding 180. The DNA pool must be smaller than the IQ of a TV Weather girl. 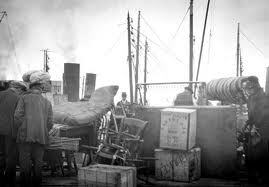 2) The entire population (36) was evacuated from Hirta on 29th August 1930. At their own request. 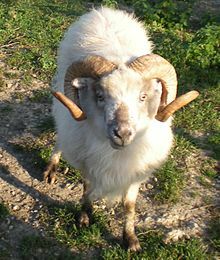 3) Sheep! 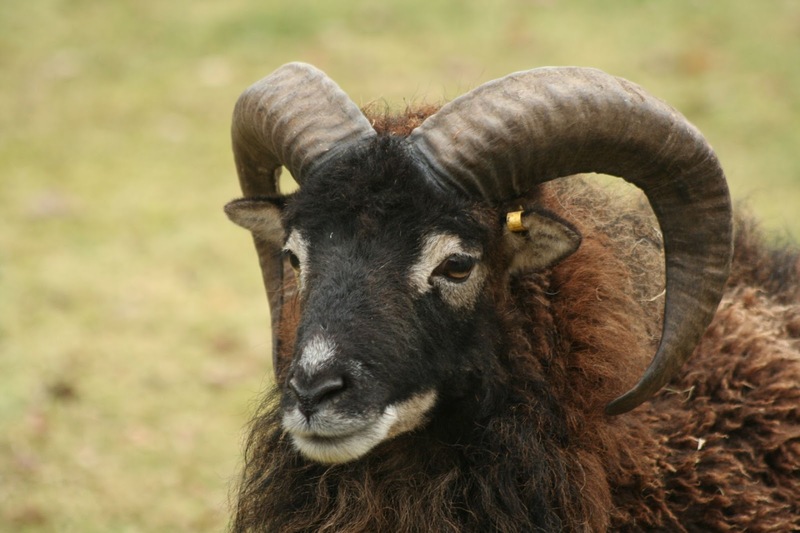 The Soay (Neolithic), the Boreray (Iron Age) type. They were feral, owned by the landowners not the islanders. They have been exported all over the world as they are small, tough and cute! 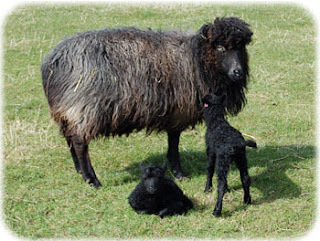 I had a friend who was a soay sheep, I called her a Soapy sheep – I was very young. 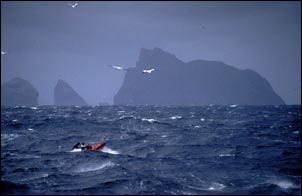 The Boreray is very rare, once of the few remaining descendants of the Dunface. 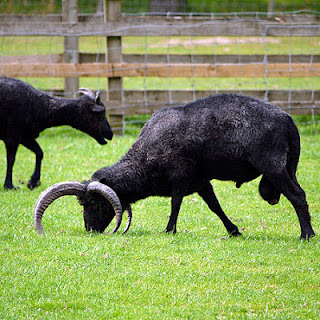 There is also a ‘St Kilda’, a black, four-horned breed. Four types of St Kilda Sheep - count those horns! 4) Visiting ships in the 18th century brought cholera, smallpox, TB and tetanus, killing so many of the population the ships often did not get enough locals on board to crew for the onward journey. 5) St Kilda wren, the St Kilda Dandylion and the St Kilda field mouse are specific species. The field mouse died out with the evacuation but the Grey seal then appeared. There are no trees. They can't cope. 6) There has been a small military base there since 1957. 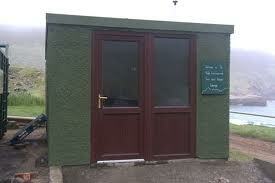 The canteen is not open to the public. A direct hit by a sub in WW 1I killed one lamb. The sheep ran away and hid. 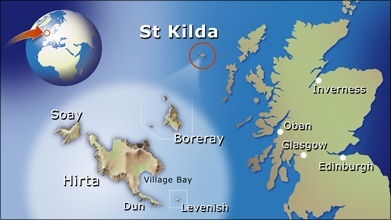 7) There is no actual St Kilda saint. A Dutchman probably overheard the Norse Sunt Kelda. Sweet Wellwater. Sweet? No. Bird pooh, plenty. 8) It is mostly granite and grabbo from a volcano 140 feet below sea level. I'm sure this is puny compared to Icelandic volcanoes but we never affect air traffic control. 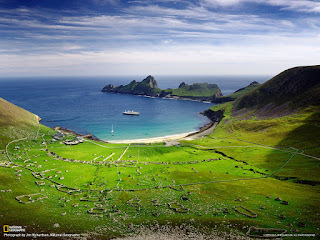 9) Hirta is 1,700 acres. Soay 240 acres. Much of it is vertical. north face of Conachair is a vertical cliff up 1,401 ft high- the highest sea cliff in the UK. 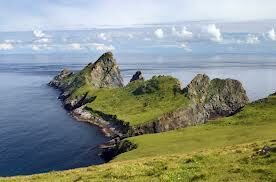 11) The island of Dùn was once joined to Hirta by a natural arch. The romantic version is that the arch was broken when struck by a galleon fleeing the defeat of the Spanish Armada. More credible is the wind blew it away. The little brothers. Ground nesting. Tasty. 12) St Kilda has the world's largest colony of Northern gannets, Leach’s petrels, Atlantic Puffins, The last Great Auk (Pinguinus impennis) seen in Britain was killed on Stac an Armin in July 1840. 13) The archipelago's isolation has resulted in a lack of biodiversity. Polite way of saying small DNA pool. 14) St Kildans used to pay rent by collecting sea birds (gannet and fulmar), salting them, storing them. The smell was awful. 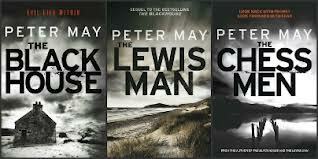 Peter May’s crime novels describe a similar life style. Diet wise they ate the eggs and the young both fresh and cured. 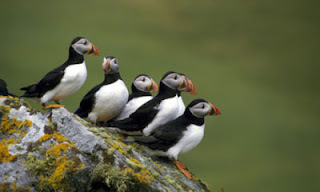 Adult puffins were also caught by the use of fowling rods– a compound of rotten fish and stinking seafowl. 15) They have always been isolated. In 1697 the only way to get there was rowing in an open boat for several days through 40 feet waves. They knew nothing of the Battle of Culloden in 1746. 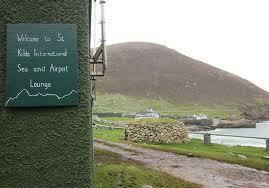 It was rumoured that Bonnie Prince Charlie and some Jacobites had escaped to St Kilda. The British soldiers followed only to find a deserted village. 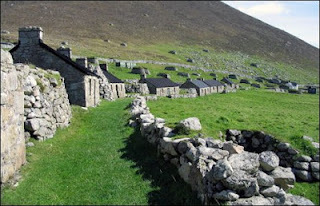 The St Kilda’s, fearing pirates, had hidden in some caves. When they were talked down, the soldiers discovered that the natives knew nothing of the prince. Or King George II. Or Kim Kardashian. 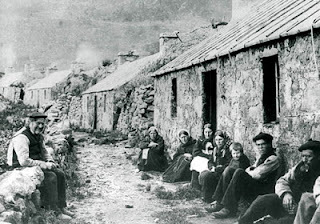 16) By the late 19th century, the islanders could communicate by lighting a bonfire on the summit of Conachair and waiting for a passing ship to see it. 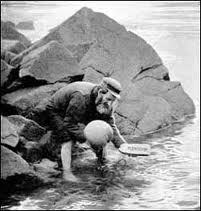 Then the St Kilda “mailboat" was invented. 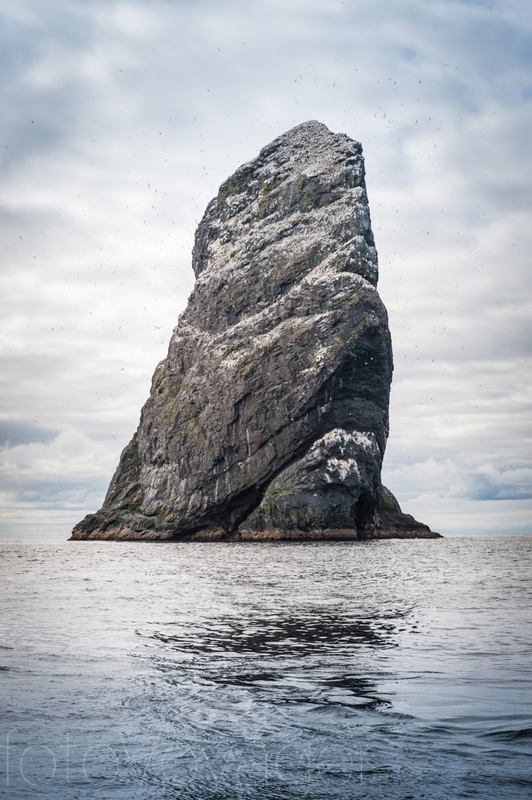 The St Kildans would carve a piece of wood into the shape of a boat, attach it to a sheepskin bladder and launch it when the wind was from the north-west. The messages eventually reached the west coast of Scotland or, Norway. Still quicker than our first class post. 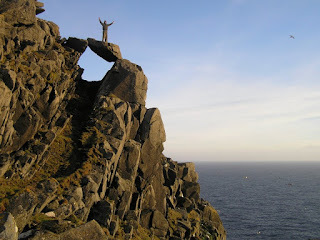 17) The birding activities required considerable climbing skills, especially on the precipitous sea stacks. They have an island tradition involving the 'Mistress Stone', a door-shaped gap in the rocks of Ruival over-hanging a gully. Young men climb up there to stand on one leg, and do the twist.... to prove that they are worthy of a wife. Would you marry a man who did this to impress you? Now working the timer on the Tivo - that's impressive. 18) The daily parliament of the islands was the vision for the Scottish parliament opened in October 2004. Because the islanders felt they had true liberty. And no St Kildan is known to have fought in a war, and in four centuries of history, no serious crime committed by an islander was recorded there. 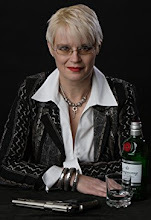 No serious crime.....so put a Scot on an island- happy chappy. Put a Scot on the same island as the England, we head the murder tables for Europe! 19) It had three churches. And five druid alters. Probably the same can be said for the mainland! 20) The Church of Scotland found out- a minister gave 13 lengthy sermons during his first 11 days. 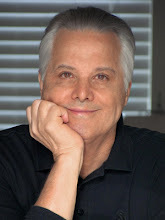 He supported the community while privately appalled by their lack of religious knowledge. Another minister introduced a routine of three two-to-three-hour services on Sunday with compulsory attendance. “It was time of intolerable gloom. Eyes were bent upon the ground. On the Sabbath It is considered sinful to look to the right or to the left." Children were forbidden to play games and required to carry a Bible wherever they went. 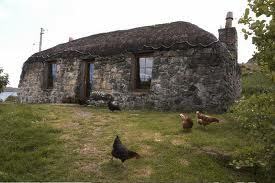 21) Due to similar weather as Lewis - they also had blackhouses, 25 to 30 houses altogether. The older beehive style, that resembled small green hills. They had thick walls of dry stone and were roofed with turf. One tiny window, a small aperture for letting out smoke from the peat fire that burnt in the middle of the room. The interiors were black with soot, hence ‘black house.’ The cattle occupied one end and once a year the straw from the floor was stripped out and spread on the ground. I use this fact as my argument for getting the Dyson out once a year. This is the International Sea and Airport Lounge! Just to be clear.....this is Mykonos. This is St Kilda. Got it? Mykonos is not as green, Mykonians (regrettably) do know of the Kardashians, its airport lounge is not as modern as St. Kilda's (assuming one can find it), our black houses are white, our natural landscape strikingly similar (sans umpteen thousand all white buildings), and the DNA pool a wee bit larger. About the only serious difference I can see is that four-horned creatures are not indigenous to Mykonos but do migrate here in droves each tourist season on two, not four, legs. And, of course, there is that little difference in our beaches, sunlight, and temperature...but that would be rubbing it in. As in suntan lotion. 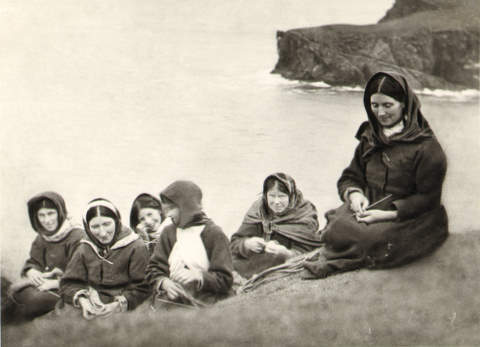 Those of us whose ancestors come from rocky islands in the north Atlantic are hardy souls. We don't suffer from trendy problems like seasonal affective disorder. We view the appearance of the sun as a pleasant surprise rather than a right. We wear heavy knitted sweaters made from wool from which the natural element that keep keeps the sheep dry is not removed. What would be the point of having something that can only be worn 25 days a year? Irish women need not spend money on fancy moisturizers since there is fine mist available for free. (I can attest to this. I spent a summer in Ireland and my skin was never better). On the other hand, if someone has hair that curls naturally, they will look like Shirley Temple (I can attest to that as well). Suntan lotion? After a summer in Ireland, the only part of me that was tanned were my hands. Anyone who has flown over Ireland knows that its claim to have forty shades of green is no exaggeration. Conan O'Brien says the Irish were bred to live in a bog. The Mykonians have to deal with the heat of the sun all the time. How pleasant can that be? Two millennia = 2,000 years - not 2,000,000!